In the tradition of popular board games like checkers, Boggler should offer hours of intriguing strategic planning as you try to capture your opponent's pieces and avoid capture yourself. This is a simple, yet challenging, game of skill. The object of the game is to capture five pairs of your opponent's pebbles or to get five consecutive pebbles in a row, either vertically, horizontally, or diagonally. 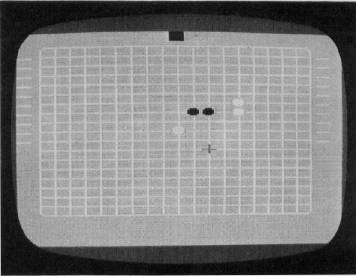 In this version, the computer acts as the playing board, checking all moves for validity and keeping score for the two opposing players, who alternate turns. 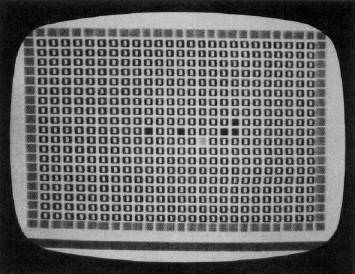 At the top center of the screen is a box indicating, by turning either black or white, whose turn it is. White always goes first in the center of the board. A joystick is used to position the player's pebble in the desired location, and the fire button is used to drop the pebble. 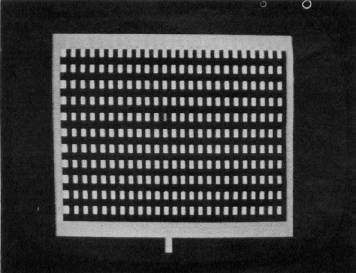 The program then checks to see if the player has either captured a pair of his opponent's pebbles by placing, one of his on either side or has five pebbles in a row. If he has captured two pebbles, it places them on his side of the board. To begin play after the instructions are printed, touch any control on the joystick. Two final notes on the program: If you should try to go off the board, you will be brought back to the opposite side from where you left. As you take a new turn, the program will always return you back to where you made your last play. Setting up a trap in "Boggler," VIC-20 version. In these adaptations of the VIC-20 version of "Boggler," two players take turns moving their playing pieces. Player two goes first, since player one's piece is placed in the center automatically. Use joysticks plugged into the first two ports to move the pieces in the Atari version. The arrow keys (E, S, D, X for the TI; I, J, K, M for the Apple) are used in the other versions. Position the piece, and press RETURN (or ENTER) to place the piece. You cannot place a piece on top of another piece. The various versions of Boggler illustrate how you can translate programs from one machine to another. The Atari version was written first (not following the VIC version). The TI version was written following the Atari version. The TRS-80 Color Computer version was next, and finally the Apple II version, based on the Color Computer version. Overall, the programs are similar, but none are written in "general" BASIC. 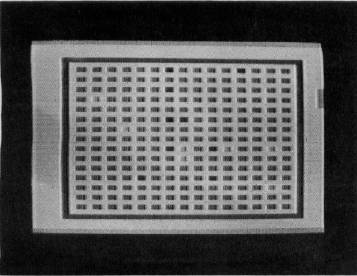 Each attempts to use the computer's special graphics and/or sound capabilities. This avoids the boring "teletype" style of gaming you get with games written in totally transportable BASIC, but does require familiarity with each computer. 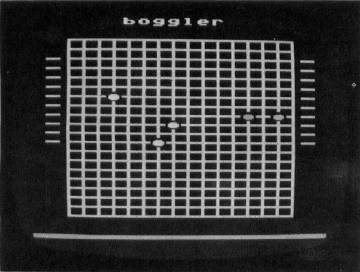 The TRS-80 Color Computer version of "Boggler." Outmaneuvering an opponent in the TI-99/4A version of "Boggler."